93% of attendees who filled in a feedback form rated the talk as “Excellent”. It was the first Classics in our Lunchtimes talk atended by 46% of the audience and they all felt it was good enough to be worth coming to another talk in the series. I hope you enjoy it as much as they did! See all the talks in the Classics in our Lunchtimes series. Malcolm Heath (Classics: University of Leeds), expert on Aristotle, examines the role of Aristotelean biology in the development of modern scientific methods; includes Charles Darwin’s opinion of Aristotle! 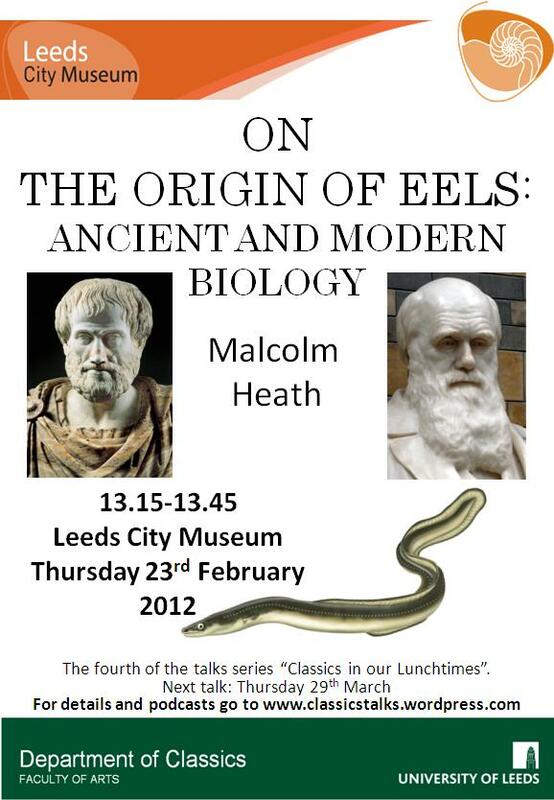 View the Origin of Eels PowerPoint.